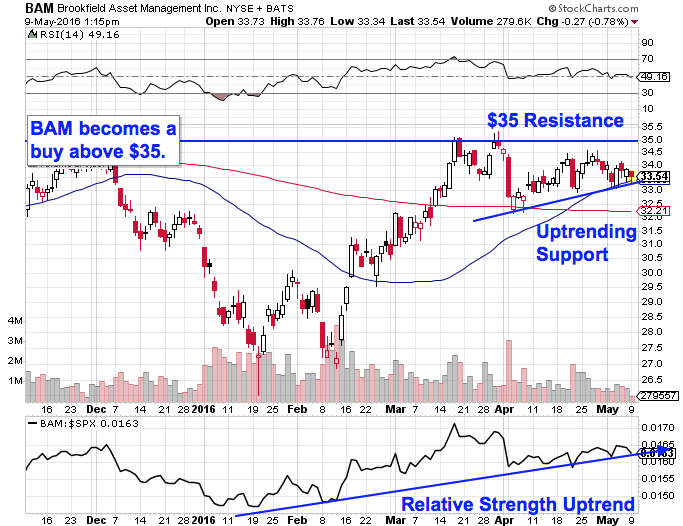 These five technical setups in the financial sector are showing solid upside potential right now. 2016 didn't start out as much of a year to like financials. By the time mid-February rolled around, the Financial Sector Select SPDR ETF (XLF - Get Report) was already down almost 18% on the year. But investors who've ignored what's been happening in the financial sector since then are missing out on the biggest rebound story of the year. Since bottoming nearly three months ago, financials have been staging a powerful turnaround, rallying half again as much as the rest of the S&P 500 index. And odds are we haven't seen the end of the recent relative strength in financial sector stocks. That's because many of the individual stocks within the sector are showing breakout price setups of their own in May. Today, we're turning to the charts for a closer look at five breakout moves within the financial sector -- and when to buy them. Leading off our list today is $33 billion alternative asset manager Brookfield Asset Management (BAM - Get Report) . Brookfield has been an outperformer in 2016. While the rest of the broad market has been battling to keep hold of breakeven year-to-date, this big fund manager is actually up almost 7% since the calendar flipped to January. And a classic continuation pattern points to more of the same as we head deeper into May. Brookfield is forming an ascending triangle pattern, a bullish continuation pattern that signals more upside ahead. The ascending triangle is formed by a horizontal resistance level up above shares at $35, and uptrending support to the downside. Basically, as Brookfield bounces in between those two technically important price levels, shares have been getting squeezed closer and closer to a breakout through their $35 price ceiling. When that happens, we've got our buy signal. Relative strength is the side indicator to pay attention to in shares of Brookfield. That's because Brookfield's relative strength line has been in an uptrend since January, indicating that not only has this stock been outperforming the S&P 500 all year long, but it continues to outperform this spring. As long as that relative strength uptrend remains intact, BAM is positioned to keep on beating the market averages. We're seeing the same price setup in shares of UK-based financial services firm Lloyds Banking Group (LYG . Like Brookfield Asset Management, Lloyds bottomed back in February, and shares have been moving higher ever since. More recently, an ascending triangle has been signaling the potential for more upside in this $67 billion bank. The big price level to watch is resistance up at $4.10. What's so special about the the $4.10 level? It all comes down to buyers and sellers. Price patterns, such as this ascending triangle setup in Lloyds, are a good quick way to identify what's going on in the price action, but they're not the actual reason that makes the stock tradable. Instead, the "why" comes down to basic supply and demand for LYG's shares themselves. 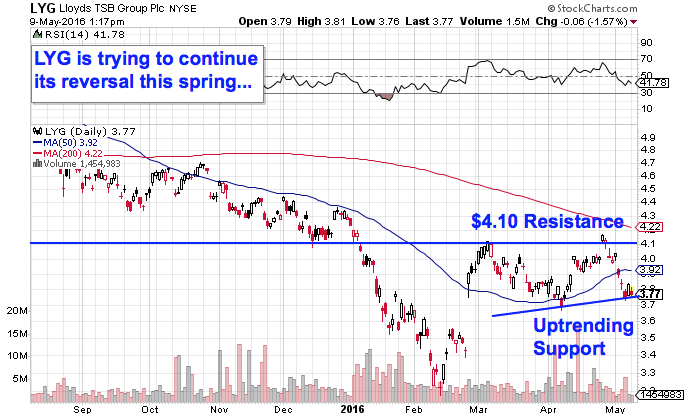 The $4.10 resistance level is a price where there has been an excess of supply of shares; in other words, it's a spot where sellers have been more eager to step in and take gains than buyers have been to buy. That's what makes a breakout above $4.10 so significant - the move means that buyers are finally strong enough to absorb all of the excess supply above that price level. If Lloyds can muster the strength to break above $4.10, this stock finally becomes a high-probability buy. Things have been looking pretty straightforward lately in shares of Citigroup (C - Get Report) . 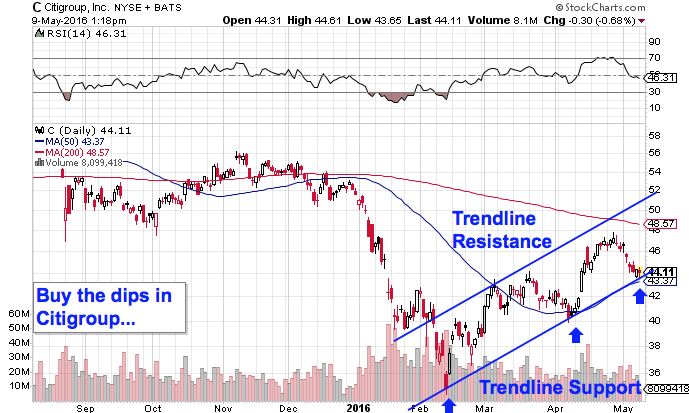 Since January, Citi has been bouncing its way higher in a well-defined uptrending channel. And as shares test trend line support for the third time since this pattern started forming, it makes sense to buy the next bounce higher in this $130 billion banking behemoth. Citi's price action doesn't exactly take an expert to figure out. Instead, the price pattern is as simple as they get. The uptrend in Citigroup is formed by a pair of parallel trend lines that have identified this stock's high-probability range for almost all of 2016. Every test of the bottom of that trend channel so far has given buyers a low-risk, high-reward opportunity to build a position in shares, so as we touch support for the third time, the next bounce higher is our buy signal. Waiting for that bounce is important for two key reasons: It's the spot where shares have the most room to move up before they hit resistance, and it's the spot where the risk is the least (because shares have the least room to move lower before the channel breaks, and you know you're wrong). Remember, all trend lines do eventually break, but by actually waiting for a bounce to happen first, you're ensuring Citigroup can still catch a bid along that line before you put your money on shares. From here, the 50-day moving average looks like a good place for buyers to park a stop loss. "We expect Citigroup to outperform its peers in the intermediate term as it benefits from 1) a well-positioned franchise that can withstand uneven global GDP growth, reduced commodity prices and a slower trajectory for U.S. rate increases, while outperforming its peers if the global economy strengthens; 2) the exit from weaker/less profitable businesses and a renewed focus on areas of strength; 3) solid efficiency ratios and a strong focus on cost controls; 4) its asset sensitivity (U.S. rates +100 basis points, net interest income up $1.4 billion, with the majority tied to the short end); 5) Citi "bad bank" holdings continuing to slim down and turning a profit in 2016; and 6) an acceleration of capital redeployment with stress results and a further acceleration in 2017." From a technical standpoint, $37 billion Japanese financial services firm Mizuho Financial Group (MFG has actually looked "bottom" for most of 2016. But shares are finally looking like they've reached the fourth quarter of the setup -- and that means shares are back within grabbing distance of breakout territory. Here's how to trade it. Mizuho has been forming an inverse head and shoulders pattern for most of this year. The price pattern signals exhaustion among sellers, and it's formed by two swing lows that bottom out at approximately the same level (the shoulders), separated by a lower low (the head). 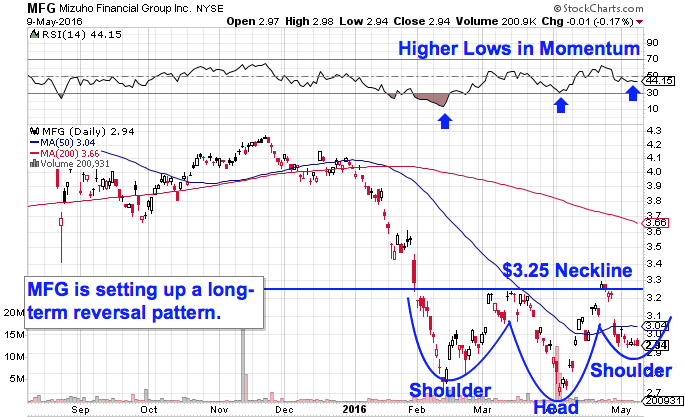 The buy signal comes on a move through Mizuho's neckline at $3.25, which is the key price level to watch from here. Price momentum, is the indicator to look at in Mizuho Financial Group. 14-day RSI, up at the top of the price chart, made a series of higher lows at the same time its price was bottoming in the inverse head and shoulders pattern. That's a bullish divergence that tells us buying pressure has been quietly building behind the scenes. Once shares can catch a bid above $3.25, Mizuho Financial becomes a high-probability buy. Insurance holding company Endurance Specialty Holdings (ENH rounds out our list of potential financial sector breakouts this afternoon. Like Mizuho, this mid-cap Bermuda-based insurance stock is showing traders an inverse head and shoulders pattern, in this case with resistance up at the $66 level. At a glance, the price pattern in Endurance isn't exactly textbook. Typically, the inverse head and shoulders setup comes in after a protracted downtrend, not an extended sideways correction like we've seen in this stock. That said, while the pattern may not exactly be textbook, it's certainly tradable. 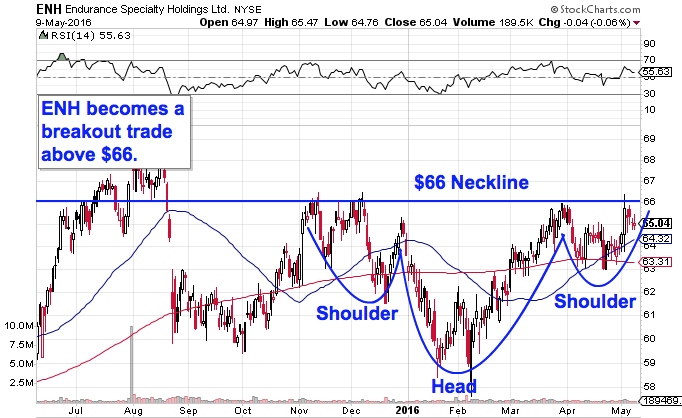 That aforementioned $66 neckline level is the line in the sand that needs to get taken out for Endurance Specialty Holdings to become a high-probability buy. The 50-day moving average has been acting like a decent proxy for support in recent sessions. For that reason, once ENH musters the strength to close above $66, that 50-day level becomes a good place to park a protective stop loss.